Special Session on the linkage of social and natural sciences - freshproject-urbanalgaes Webseite! 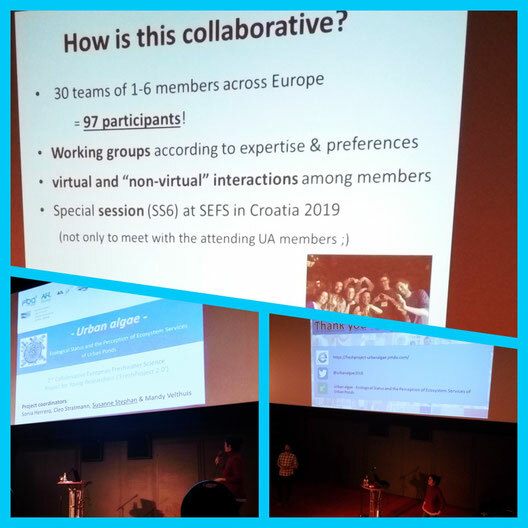 We successfully submitted a proposal to the 11th Symposium for European Freshwater Sciences (SEFS11), which will take place from June 30 to July 5 (2019) in the capital of Croatia - Zagreb. The Special Session (SS6.) is titled "Linking natural and social science in freshwater ecosystems". Aquatic ecosystems are prone to be altered by human-driven actions. As a basis for the sustainable preservation of ecosystems and the services they provide, cooperation between social and natural sciences is of special importance. Studies focusing on the linkage between ecology and societal perception are increasing, as well is the relevance of multidisciplinary collaborations. This session aims to bring together projects that use both natural and social science to study freshwater ecosystems and underline the importance of collaborations of e.g. scientists, managers and citizens. Therefore, we encourage oral presentations and posters on projects on (freshwater) ecosystems with multidisciplinary, collaborative and innovative character with societal relevance. Besides discussing interesting hypotheses, methodological approaches and outcomes, we also want to address the pros and cons that the intersection of natural and social sciences brings along. Every year, the Leibniz-Institute of Freshwater Ecology and Inland Fisheries (IGB), located in Berlin, organises a one-day inhouse seminar/platform for the inner institutional exchange called the “Science day”. Everybody gets a chance to introduce (ongoing) projects and research ideas while also using more entertaining formats such as movies, science quizzes or little theatre plays. The scientific part is followed by a party and live music. In December 2018, the last Science day at IGB took place with a whole morning session on Urban Ecology. Our project Urban Algae had been invited to participate and we used the chance to introduce our research goals, methodology and the team to the institute. The feedback was very positive and especially young scientists showed great interest. Thanks to the many active members of Urban algae, we had a couple of nice postings on Twitter afterwards as well. Together with the Urban algae team we developed the field sampling protocol, that was used in our summer samplings. We gathered expertises of many different Urban algaers, and everyone could comment, add references, contribute with knowledge and practical experiences. Together we came up with an almost 30 pages protocol using scientific methods, to sample various parameters in urban ponds. Next to methods on various water-quality parameters, we developed also a list of questions about the ponds' characteristics. In the field each team had to go around the pond, and investigate if the pond, for example had publicly accessible information boards, or if there were threes in a certain distance around the pond. This data will be used to identify uses and management of the ponds, as well as to categorise ponds and explain possible variation in the ecological status. Next to this we developed a methodological approach on how to photograph the ponds. 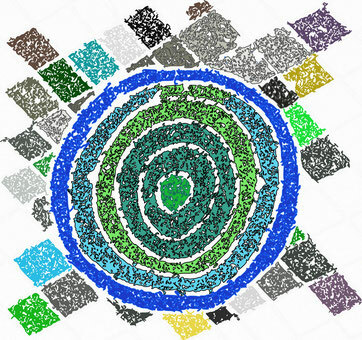 This was done, to have high quality pictures to be used in the citizen SURVEY (coming soon). If you want to know more about out methodologies and the sampling protocol, you can contact us. The protocol will be released together with the project article, once the samplings (a survey is also a sampling) are done and the data is analysed. We want to thank many colleagues and senior scientists (outside of Urban algae) for their expert input and especially we thank Evi Mantzouki et. al (2018) who gave us inside view in the field protocol of her European Multi Lake Survey (EMLS). Thank you all. First project poster - what urban algae is about. 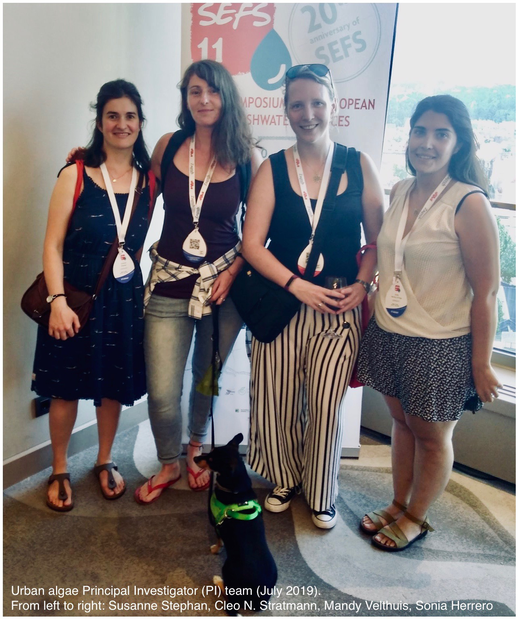 We were represented with a project poster at the conference of la Asociación Ibérica de Limnología in Coimbra, Portugal, in June 2018 and at the yearly conference of the German Limnological Society (DGL) in Kamp-Lintfort, Germany. September 2018. Here you can download our poster and get an idea what Urban algae is about - aims - hypotheses - methods. And look at this long list of co-authors. This is collaboration!